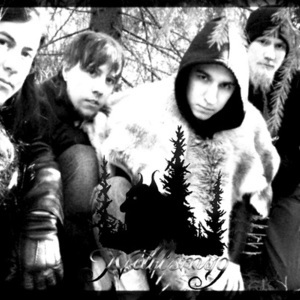 Nattsmyg is a Black Pagan/Folk Metal band from Sk?ne, Sweden, created in 2005 by Dan "Nattsmyg" Heikenberg. Dan played in the Viking Metal band Frostnatt before, but he didn't get along well with the other band members and so he stopped with it and formed Nattsmyg. With the help of Anton "Svartsmed" Hinterlach, who also played in Frostnatt, he recorded a first demo tape called "I Nattens Dunkel". He continued his solo-project and untill now he has recorded five demos and two full-lengths with Nattsmyg. Dan played in the Viking Metal band Frostnatt before, but he didn't get along well with the other band members and so he stopped with it and formed Nattsmyg. With the help of Anton "Svartsmed" Hinterlach, who also played in Frostnatt, he recorded a first demo tape called "I Nattens Dunkel". He continued his solo-project and untill now he has recorded five demos and two full-lengths with Nattsmyg. Unfortunately Nattsmyg can't offer their demos and their full-lenghts for free on their homepage anymore "because of sites that abuse that the CDs are for download, steals them and sells them on their sites without our knowledge. It happened to N?r Solen Slocknar, and we don?t know how to deal with it yet. "(Nattsmyg). But there will be a CD-Box which will contain all five Nattsmyg demos, their full-lengths and a new album which is nearly finished already.